La Cotte de St Brelade is a Paleolithic site of early habitation in Saint Brélade, Jersey. Cotte means "cave" in Jèrriais. The cave is also known as Lé Creux ès Fées (The Fairies' Cave). At that time, with sea levels slightly below those at present, Jersey was part of Normandy, a peninsula jutting out from the coast, and La Cotte would have been a prominent landmark on the dry plain that linked Jersey to the French mainland. 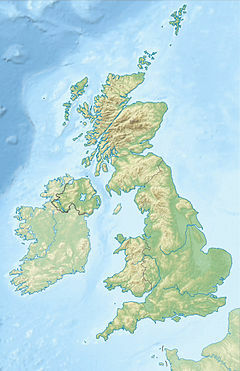 It was not until after the last Ice age that the sea eroded the coastline, separating first Guernsey, then Jersey and finally the Écréhous from the mainland. Remains of fire was found in La Cotte. In fact, the earliest dates obtained for artifacts at the site (238,000 BP) come from thermoluminescence dating of burnt flint. The immense timespan represented by the Paleolithic artifacts at La Cotte—nearly 200,000 years—saw considerable cultural changes among the prehistoric users of the site. The earliest stone tools, dated between around 240,000 years to 200,000 BP, are fairly typical of early Middle Paleolithic sites. From around 200,000 BP, however, there is noticeable elaboration in the procedures used to manufacture stone implements, with an increased use of Levallois (prepared core) techniques, and an increased efficiency of raw material usage as tools were resharpened and reused for multiple purposes throughout their ‘lifetimes’. Dated at approximately 180,000 BP, two impressive piles of animal bones, consisting of selected cuts of mammoths and woolly rhinoceros, appear to have been dragged beneath an overhang after being butchered. These innovations mark a transition stage between Middle and Upper Paleolithic subsistence strategies. Excavations have taken place from around 1910 onwards. Robert R. Marett (1866–1943) worked on the palaeolithic site from 1910–1914, recovering some hominid teeth and other remains of habitation by Neanderthal man. He published "The Site, Fauna, and Industry of La Cotte de St. Brelade, Jersey" (Archaeologia LXVII, 1916). The teeth were dated using new techniques in 2013, this analysis put them at between 100,000 and 47,000 years old. In 1911, Arthur Smith Woodward (director of the geology department at the British Museum of Natural History) was asked by R.R. Marrett to inspected the findings at La Cotte. At the time, Woodward was engaged in the archaeological discovery of "Piltdown man", which later became notorious as a hoax, and he used a comparison of findings at La Cotte to argue for an early dating of his Piltdown material. The Cambridge University excavations of the 1960s and 1970s found important examples of remains of Pleistocene mammals carried into La Cotte, including a pile of bones and teeth of woolly mammoth and woolly rhinoceros. Prince Charles took part (as a student) in these excavations, directed by Professor C.M.B. McBurney, which were later published. Katharine Scott, in 1980, published an article on the hunting methods used by Neanderthals at La Cotte in which she argues that they stampeded and drove the mammoths off the nearby cliffs, but this theory has since been disputed. In 2010 excavations were renewed at La Cotte by a multi-disciplinary team from British Institutions including UCL, The British Museum the University of Southampton and University of Wales Trinity Saint Davids. These on-going excavations revealed new archaeological levels at the site and determined the presence of deposits younger than 47,000 years ago still present at the site. ^ Rambles among the Channel Islands, by a naturalist. London: Society for Promoting Christian Knowledge. 1855. p. 191. ^ Bates, Martin; Pope, Matthew; Shaw, Andrew; Scott, Beccy; Schwenninger, Jean-Luc (16 October 2013). "Late Neanderthal occupation in North-West Europe: rediscovery, investigation and dating of a last glacial sediment sequence at the site of La Cotte de Saint Brelade, Jersey" (PDF). Journal of Quaternary Science. 28 (7): 647–652. doi:10.1002/jqs.2669. ^ "New Research Conducted at Late Neanderthal Site - Archaeology Magazine". Archaeology.org. Retrieved 20 October 2013. ^ a b Cunliffe, Barry (1994). The Oxford Illustrated Prehistory of Europe. Oxford: Oxford University Press. p. 29. ISBN 978-0198143857. ^ "BBC News – Jersey's place in Neanderthal history revealed in study". BBC News. Bbc.co.uk. 20 October 2013. Retrieved 20 October 2013. "La Cotte de St. Brelade 1961 – 1978: Excavations by C.B.M. McBurney." (Geo Books, Norwich). "Prehistory and the Beginnings of Civilization. Volume: 1". by Jacquetta Hawkes – author, Leonard Woolley – author. (1963), p140. Wikimedia Commons has media related to La Cotte de St Brelade.